﻿﻿ First Lieutenant Tamar, a graduate of UBA Even Shmuel, made history when she graduated the Israel Air Force's rigorous pilot training school as the IAF's first religious female combat navigator. "I never expected to see her on the tarmac," Tamar's mother exclaimed, "flying was never a dream of hers! But after volunteering for two years of National Service she felt that she still needed to give more, so she enlisted. She passed all the qualifying tests for pilot's school and kept progressing stage after stage. It was surprising, but on the other hand, she was always one to set a goal and stick with it until the end. I believed in her from the start. Though every cut, we believed she would finish the course." 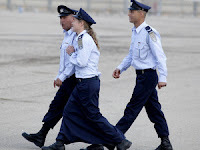 Prime Minister Benjamin Netanyahu and Defense Minister Ehud Barak attended the graduation ceremony and were also moved by the sight of a religious cadet marching in a modest ankle-length blue uniform skirt. In his address to the graduating cadets Minister Barak cited the four female graduates for praise, then turned to Tamar and added, "your actions serve as a proof that religious faith is a source of strength and courage." Statistically, 16% of IAF pilots and navigators identify themselves a traditional or religious.